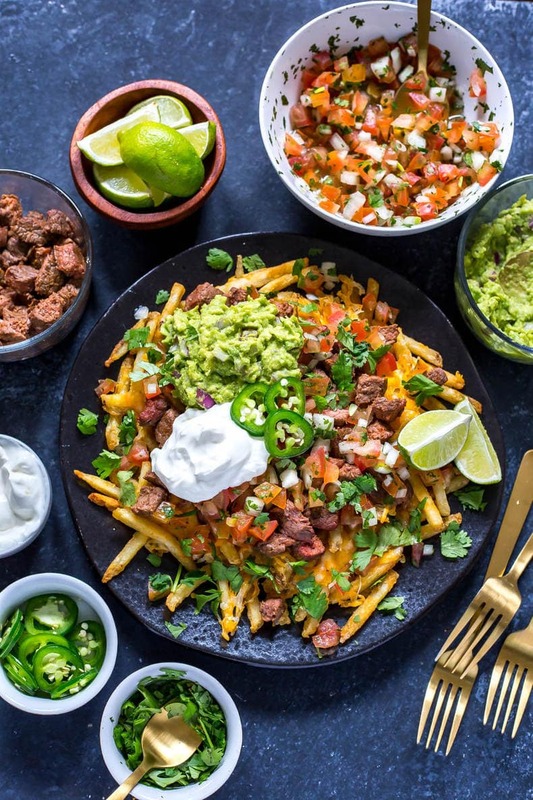 The Best Carne Asada Fries are topped with cheddar cheese, Mexican-spiced steak, pico de gallo, homemade guacamole, jalapenos and sour cream – they are the ultimate weekend food and are relatively healthy to boot! Get ready for the best Loaded Fries recipe of your life. 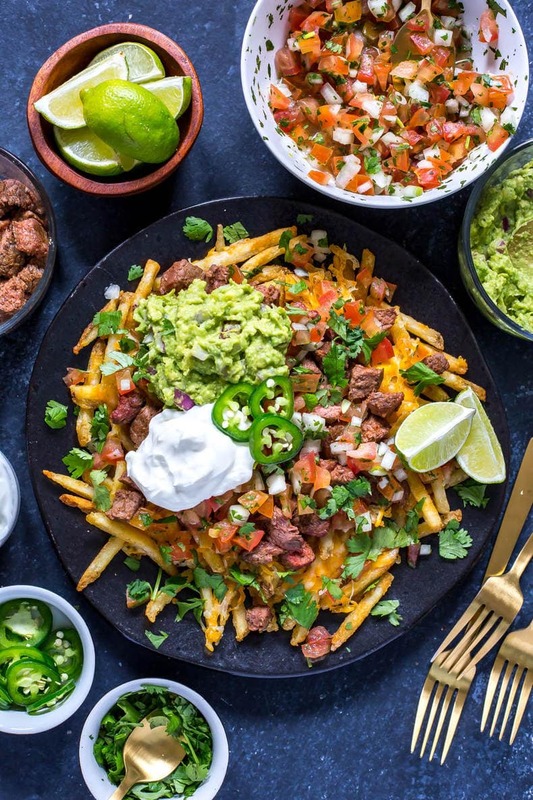 These Carne Asada Fries are mind blowing and I think I'm about to make them every week for the rest of the summer, they're so good. 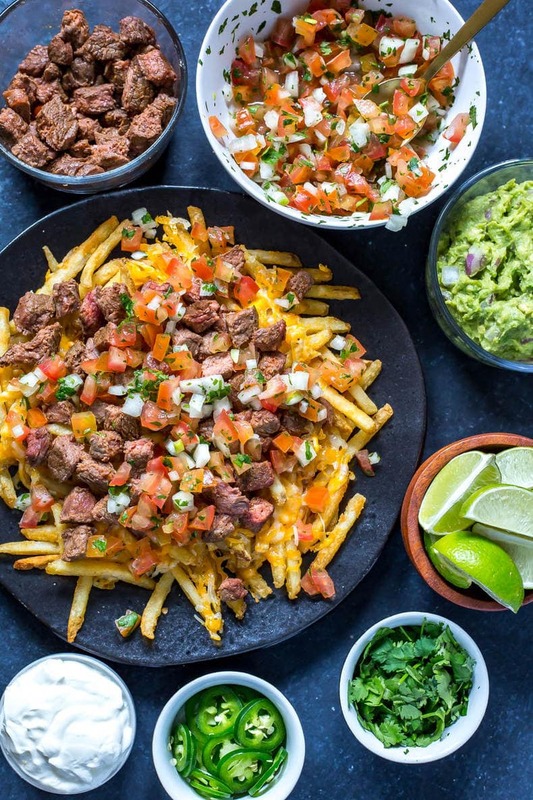 Of course I'm exaggerating a bit, but I seriously think that between the steak and the fries, we've got two of my fave foods ever, and then we've got a Mexican twist, which just so happens to be my fave cuisine. Like think about it. MEXICAN. STEAK. FRIES. Yaaaaaaaaaassssssss! 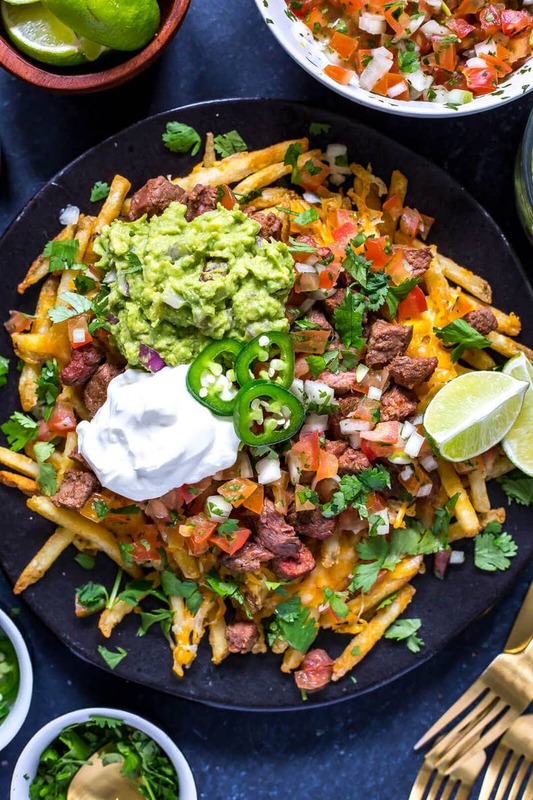 Carne Asada Fries are like a match made in food heaven. What Goes on Carne Asada Fries? 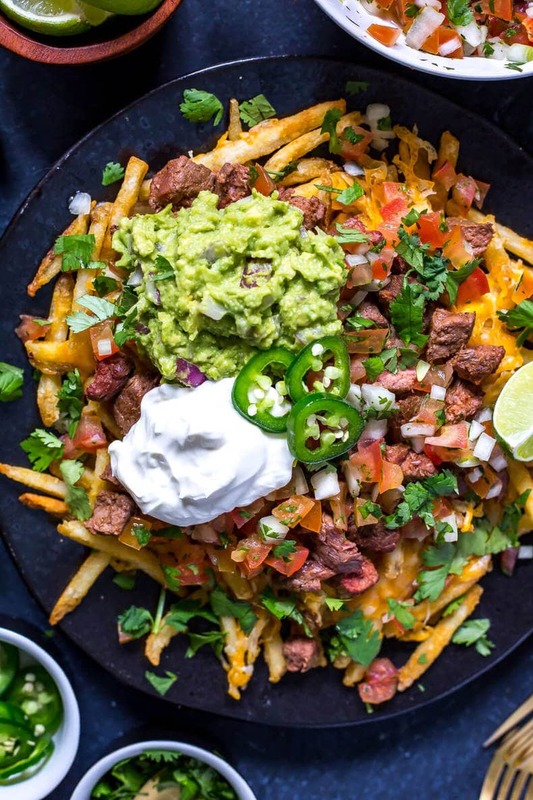 The main ingredients for these loaded Tex Mex Fries are primarily marinated steak, French fries, guacamole, sour cream, cheese and pico de gallo. Doesn't exactly sound like a super calorie friendly meal but I promise you that this dish is all about getting the portion size right and making a few healthier modifications! I like to add homemade pico de gallo and guacamole to keep the nutritional content high but still getting the flavours right. And let's be real, I'll take any excuse possible to whip up a little bit of guacamole to keep on the fridge and put on everythingggggg. If you're really looking to cut calories, one immediate suggestion I have is to cut the cheese and guac and add extra pico, jalapenos and cilantro. Avocados, while a really healthy source of fat, are relatively high in calories compared to other veggies so maybe you want to swap in some sauteed peppers to add in some extra toppings that are lower calorie. 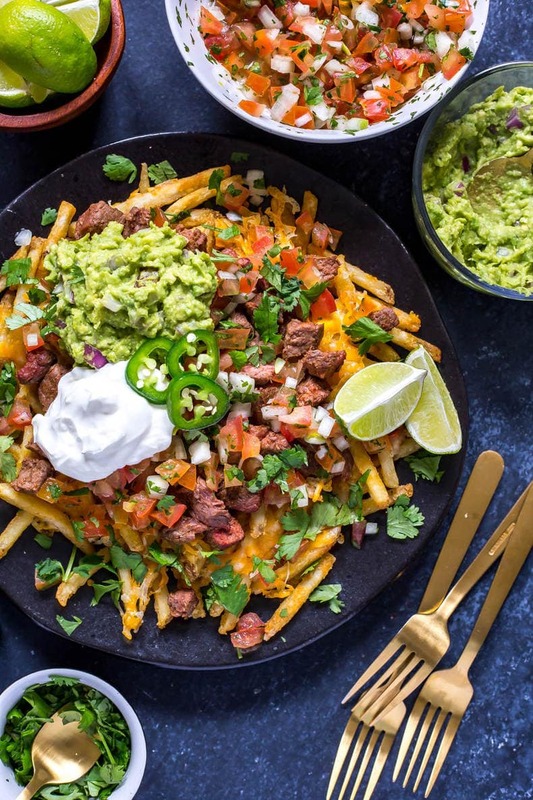 To keep these Carne Asada Fries easy and simple, I decided to use frozen oven fries instead of cutting up a russet potato by hand – that's more if you want to make this more of a quick weeknight sort of dinner. Whenever it comes to any sort of meal prep (whether it's prepping your lunches ahead or getting dinner ready after work), I'm a huge advocate of taking whatever shortcuts you can. While I believe in the 80/20 rule (eating whole foods most of the time and eating not so healthy foods about 20% of the time), I think you sometimes need to know what swaps you're making are going to have the most impact. To me, skipping the potatoes and subbing in frozen fries or even frozen sweet potato fries allows you to keep track of the portion size while at the same time cutting some of the hassle of dinner prep, so I'm all for making choices in terms of living a balanced lifestyle. Now, the steak. Ah yes, the carne asada itself. My marinade/spice rub is probably not at all authentic but I can guarantee you that it's super delicious and about as easy as it gets. Because we are ALL about easy around here. Wanna know my secret? Olive oil, salt and pepper, and a little bit of taco seasoning! Sear your steak in a skillet over medium-high heat for 2 minutes a side, then remove from heat and dice it all up. And don't be afraid to use a really cheap cut of steak! 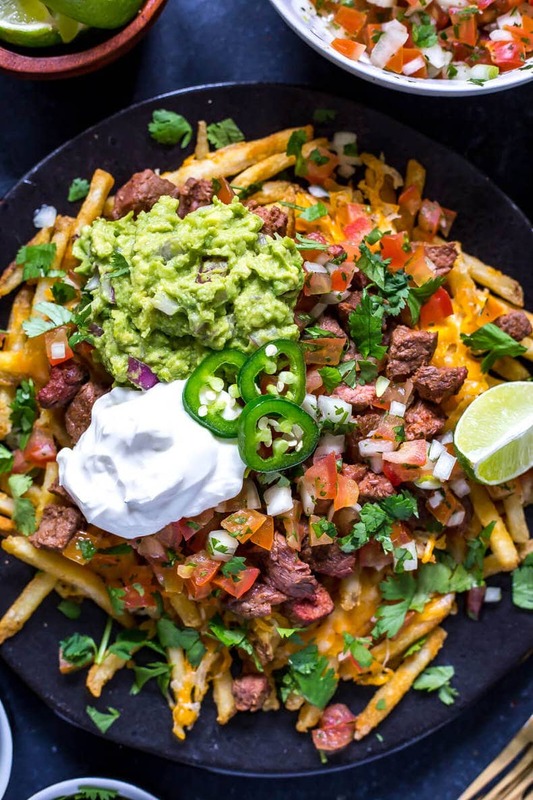 All the other toppings and flavours are going to blend together beautifully so you don't need to buy expensive meat to make these Carne Asada Fries shine. Okay, now that we have all our ingredients, all we have to do is layer it all! First start with your fries, then melt some cheddar cheese overtop of them in the oven. Remove from the oven, top with your carne asada, then your pico de gallo, guacamole, sour cream, jalapenos and cilantro. You can make all the components of this dish ahead of time if you're not up for a giant cooking project too. I usually make the salsas up to a day in advance, and sometimes I even do the steak and fries a couple days ahead and grate the cheese so it's all ready just to reheat in the oven briefly. If you're working with pre-cooked fries, throw them back in at about 375 with the cheese and bake for up to 10 minutes, then put the steak in at the last minute for a couple minutes just to get it warm again. 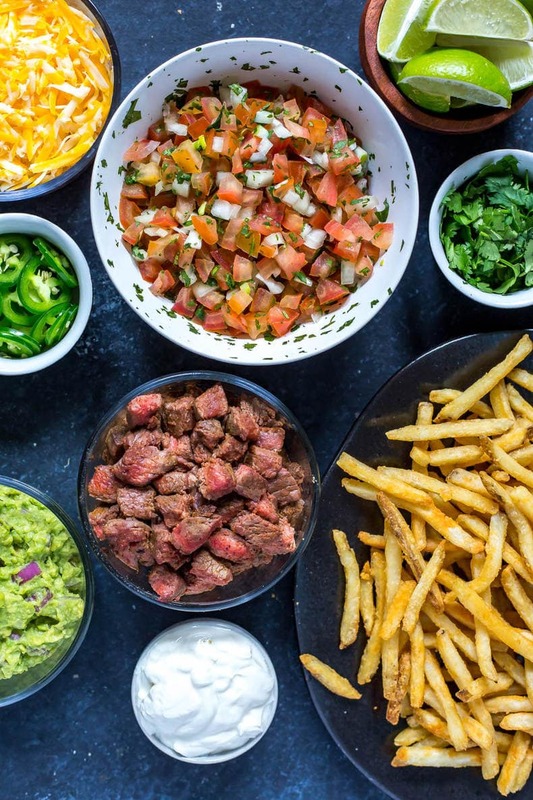 Will you be making these Carne Asada Fries? 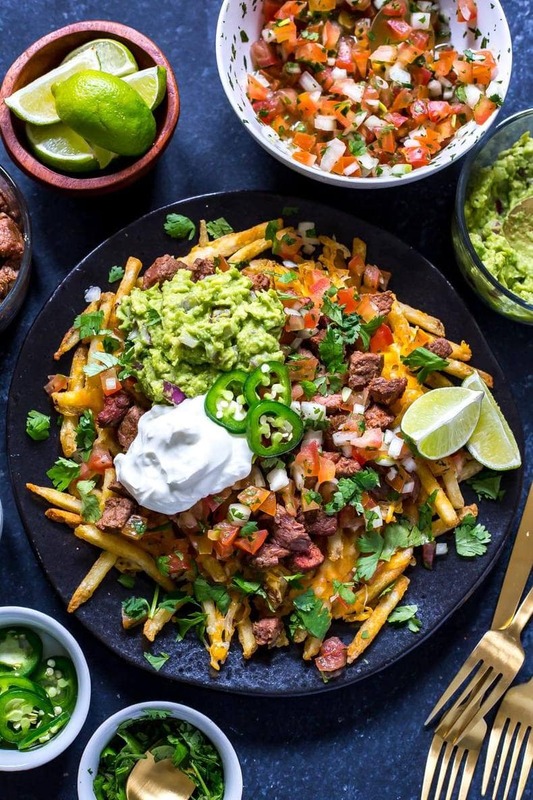 If you're craving Mexican food but also a fun recipe to stay in and cook, these loaded fries are your best bet! You'll need a good knife set to slice up the tomatoes for this pico de gall and slice the steak properly. 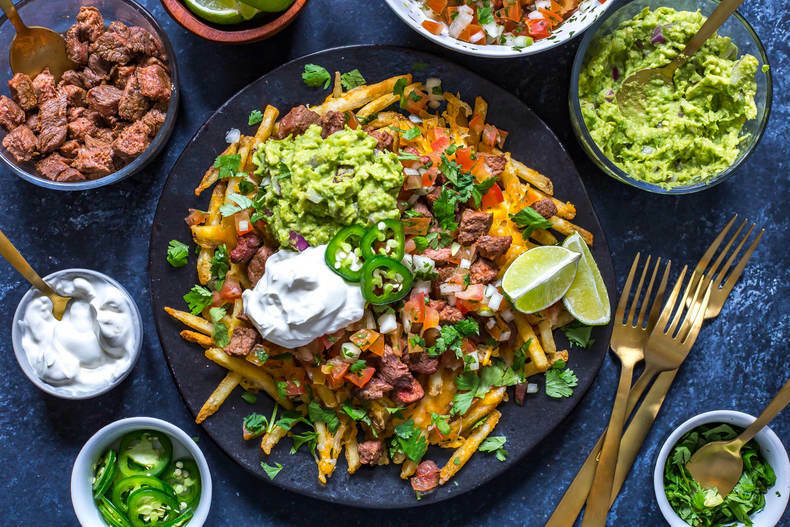 Get your square glass meal prep bowls here so you can pack these carne asada fries up for tomorrow's lunch! And of course I get all my grass-fed beef from Butcher Box – right now they're offering TWO FREE RIBEYES and bacon when you make your first order today! 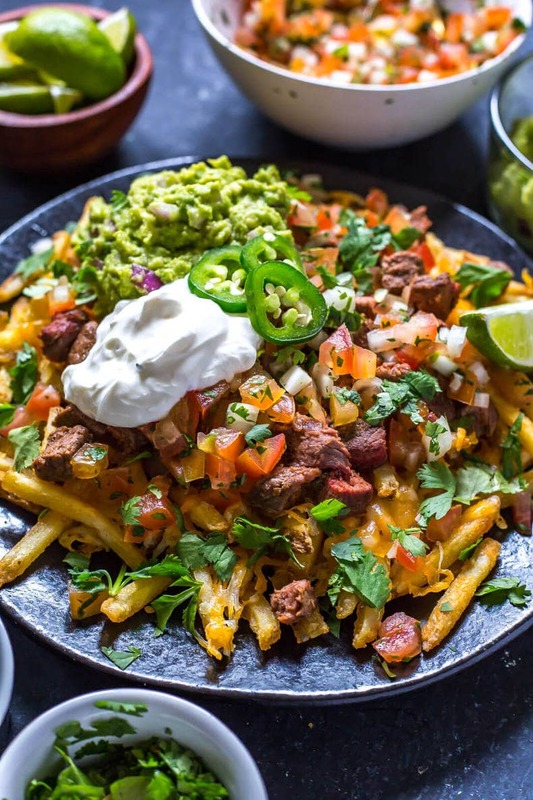 The Best Carne Asada Fries are topped with cheddar cheese, Mexican-spiced steak, pico de gallo, homemade guacamole, jalapenos and sour cream - they are the ultimate weekend food and are relatively healthy to boot! Preheat oven to 450 F. Bake fries according to package directions (usually 10-12 minutes per side). Meanwhile, mix up pico de gallo and guacamole (ignore if you are using store bought versions of either). Add olive oil to a large skillet over med-high heat. Season steak with chili powder and salt and pepper. Cook for 2-3 minutes on each side, then remove from heat and cut into 1/2-inch cubes. Remove fries from oven and top with cheese, then bake for 5 minutes or until cheese is melted. Divide among 4 plates and top with steak, pico de gallo, guacamole, jalapenos, sour cream and cilantro. Serve and enjoy!